It's a little cold for a spring holiday on the coast....so what better than explore where to eat, but we didn't want to head to the local RSL or pub, or endure fish and chips, Thai or Chinese .....Mr G and I needed something that would delight our foodie tastebuds yet also not break the bank. 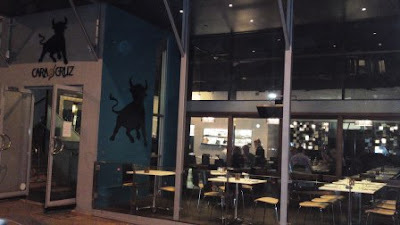 So after a little googling I came across Cara o Cruz a tapas restaurant in Terrigal. Just off the main strip, behind the Crowne Plaza, this elegantly decorated restaurant is a delicious find a perfect new little addition to the Terrigal stable. The team are friendly and helpful with perfect smiles yet totally unpretentious. Luke & his head chef Sean have created a brilliant menu that is a breath of fresh air in the world of tapas....the biggest challenge is deciding what to choose! You could take the simple option and indulge in the Matador menu but Mr G and I decided to create our own tapas adventure. 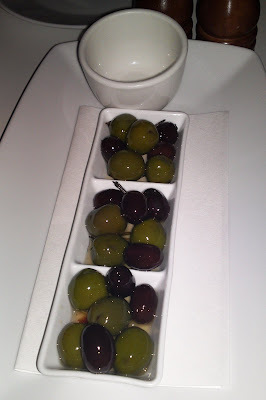 Firstly a little appetizer of marinated olives - black and green olives marinated in rosemary and olive oil, perfect with the house bread. 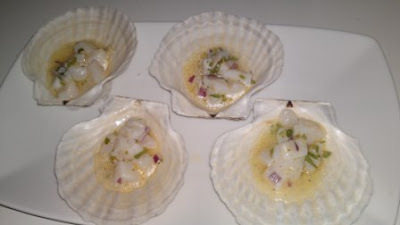 From the tapas del mer (seafood tapas) we started with the scallop ceviche a. Tender sweet scallop marinated in a vinaigrette of lime juice, olive oil, fresh coriander and a smidge of red onion... it was soo delicious we even polished off the marinade! Next up was the duo de calamares (squid two ways) which originally excited me....however was a little disappointed. The salt and pepper calamari looked beautiful on the plate and was perfectly cooked with a lightly golden crispy coating encasing a tender calamari but the braised calamari let this dish down. I was expecting a rich complex tomato sauce with hints of saffron or smoked paprika....but this sauce was sweet with not much garlic and a little too gentle for my liking yet thankfully the squid was silky and divine. 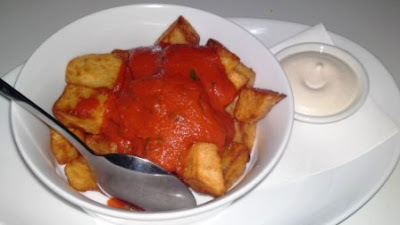 We then ventured to the vegetarian side and although we have chosen something more exotic like the manchego croquettes or the empanadas with goats cheese and caramelised onions we wanted to try the patatas bravas a classic quintessentially tapas dish. Very impressed. Crisp golden potatoes with a fluffy interior, rich tomato sauce and aioli with just the right amount of garlic. Yet our adventure was nowhere near finished and soon arrived the almond chicken. Strips of chicken breast coated in an almond crumb fried until crisp and golden perfect with the tangy romesco sauce slightly smokey from the capsicum and paprika and a tangy hint of vinegar fantastically matched to cut through the richness of the fried chicken. Our next delight was Cuenos de Toro or bull's horns. Crisp wafer cones filled with creamy mashed potato and topped with finely chopped chorizo braised in sweet apple cider vinegar with hints of smoked paprika and a slightly spicyness.....the perfect bite....I wish there were more of them! And then an intriguing dish carne de tenera - peppered veal lightly seared to rare, thinly sliced and topped with a tuna mayonnaise reminiscent of Italy's tonnato sauce. The balance of the tender veal with creamy flavoursome mayonnaise and the crisp zucchini fries was heaven and perfect with a tempranillo shiraz. By now I was getting a little full.....but who can leave without trying at least one dessert! Mr G and I shared the chocolate parfait. A cone of dark chocolate revealing a creamy semi-frozen milk chocolate mousse that was a decadently rich which is balanced by the slight tartness of the berries. If you're ever on the Central Coast, NSW and want a try a place that will give you a new food adventure with friendly and unpretentious service head to Cara Cruz.